JustFab’s Boots Were Making For Walking — Snag a Pair for Just $10! Trust us, we’re right there with the rest. In this over-edited Photoshop world, we often left finding it extremely difficult to relate to others. Everyone seems so much cooler online. We can’t even keep up with our clique — let alone celebrities. Hollywood may be just a plane ride away, but their lifestyle seems forever unattainable. Thanks to Jessie James Decker and JustFab, we too can know what it’s like to walk an A-lister’s shoes (literally). And right now, for first time members, we can scoop up a pair of our favorite country singer’s choice boots or any shoe on the site for 75 percent off, or just about $10! Jessie James Decker is married to retired-football star, Eric Decker and the two have made it their lives to be completely transparent. Whether it’s their wildly successful E! tv show, Eric & Jessie: Game On, or their constant documentation of their lives courtesy of their Instagram, we can’t help but feel as if we’re all honorary Deckers. The collaboration with JustFab was a seamless fit. JustFab is a subscription service tailored to an individual’s wants, desires and everyday life. Much like Jessie, JustFab prides itself in its ability to produce shoes that can easily transition from day-to-night and seamlessly work at a moment’s notice. Jessie is a mother of three, a well-known singer and Instagram sensation with stories that often tell a similar tale. Jessie needs fashion, function and affordability. JustFab was the answer. Earlier this year, Jessie released her much-anticipated “Boots,“ so it comes as no surprise that her must-have picks are solely based around this season’s hottest pairs! We can’t help but echo Jessie and her obsession with this stylish staple. If you’re looking for a stunning pair that will not only stand alone but update any traditional outfit, we can’t help but suggest the same pair as she did. The Rockie Heeled Tall Boot is hands down our favorite option! See It: Grab the Rockie Heeled Tall Boot for $11 (originally $64.95) on JustFab for new members! We can’t help but obsess over the Rockie Heeled tall boot. For starters, it is the perfect transitioning shoe. 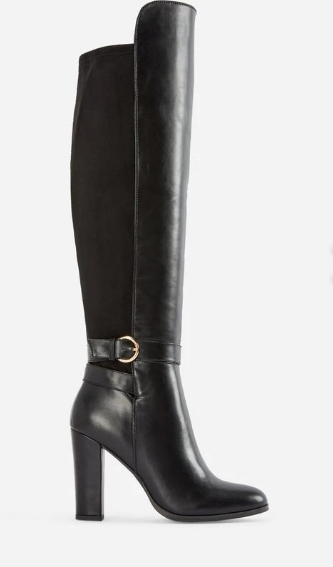 It’s a more glamorous take on the oftentimes traditional riding boot. The 4-inch heel is perfect for the shopper looking for some height. The faux leather adds a layer of sleekness and sophistication. And, the fact it comes in not only black but cognac (a reddish/chestnut color) not only adds versatility but options for all shoppers! Reviewers were just as smitten as we are, too! Almost everyone said these boots look just like they do in pictures as they do in person, noting the great quality of this shoe. One reviewer even said the pictures of these shoes do them no justice at all! Others mentioned how the shaft of these boots stays up and easily fit around their calves, unlike many other footwear options. One shopper said they were able to work all day then dance all night in these boots. Another shopper agreed that these boots were comfortable during her 10-hour work day. These boots really do work overtime in the fashion and comfort department! Plus, expect loads of compliments! One shopper said these boots are showstoppers and everyone asks where they are from. Dress these up with a pencil skirt and blouse for work or pair with a dress and tights. They can also be worn over leggings or skinny jeans, too! We can’t help but obsess over the regular JustFab membership. Current members pay $39.95 for a personalized subscription monthly. Which is already amazing! Not a member? Even better! New members have the opportunity to test out JustFab with a 75 percent off deal and get their first pair for only $10. There are no words on how absolutely amazing that truly is. After trying out the first pair for $10, members will then be on the normal $39.95 plan — but still, talk about a promotion! See It: Grab the Rockie Heeled Tall Boot for $11 (originally $64.95) on JustFab for new members! Not your style? Check out similar options available at JustFab!